When it comes to slick / wet roads, your tire tread depth plays an important role with gripping the road along with the distance it take to slow down and even stop your vehicle. The tire store that I frequently visit has a multiple check point list that they complete on each tire during the visit. Testing the tread depth is one of the first things they check along with tire pressure and physical condition of the tire. Tread depth is the distance from the top of the tire to the deepest part of the grooves of the tire. Most new tires are 8mm depth and when the tire reaches a depth of 3mm it is time to change your tires. One method that has been passed down from generation to generation on how to measure the depth of your tire tread is the penny method. Take a penny and turn Abraham Lincoln’s head up side down and place the penny within the grooves of your tire. 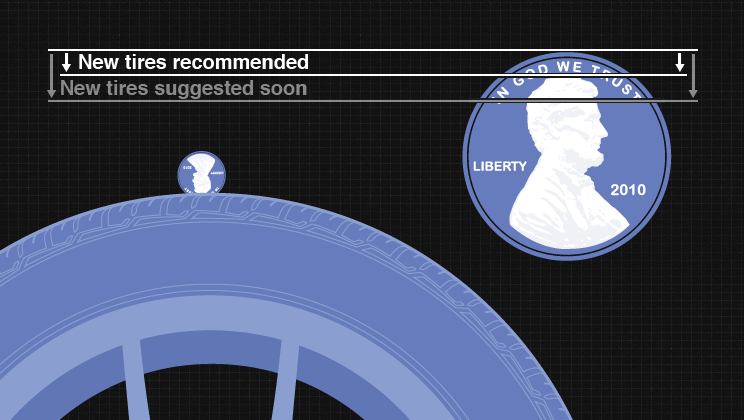 If you can see all of Lincoln’s head your tread depth is less than 2/32 and it’s time for new tires.